OK, first of all, the moniker is a little misleading. In name alone, The New Orleans Jazz & Heritage Festival has a mildly stodgy ring to it, like some kind of leisurely quasi-educational town fair. And granted, back in the day, Jazz Fest actually did resemble that quaint little town fair- in 1970, the first iteration included four stages and a gospel tent, drawing a crowd of about 350 people. But over the past 46 years, Jazz Fest has ballooned into a rollicking seven-day monster, with a huge musical bill that stacks giants like Pearl Jam and Red Hot Chili Peppers alongside legions of lesser-known and local artists. This year’s Jazz Fest, held between April 22 and May 1, was attended by over 425,000 fans. Like any serious-minded rock-and-roll vagabond, I consider it my musical duty to investigate any event with this much history and hype behind it. Right from Day One, I feel like I’m a few decades late to the party. I mix it up with some of the locals and overhear plenty of gripes about The Way It Used To Be, back when tickets cost 3 bucks and a casual fan could still see the stage. As a tourist, I’m having a blast, but as a discriminating concert veteran, I get what the locals are saying. The crowd is overwhelming. The sound is not great, especially from the Acura Stage, where most of the headliners perform. The walkways quickly become dirty and disorganized, as trash cans start to resemble small landfills. And yet, such chaos is a small price to pay for rootsy charm. 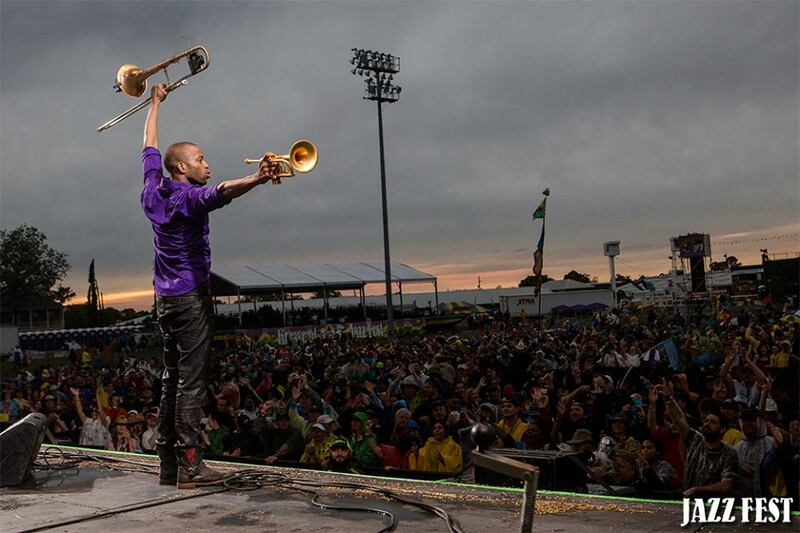 Jazz Fest is the rare large-scale festival that stays true to its eclectic local culture, spotlighting homegrown acts like Galactic, Trombone Shorty, and Better Than Ezra in their own big backyard. It’s a nice contradiction to so many other major music festivals, most of which are programmed by industry promoters and corporate bidders throwing darts at a list of hot young electropop bands. The food tents, by the way, are where you find the real breakout stars. In many cases, the vendors are more famous than the musicians playing across the field. By my count, there are just as many people clamoring for Leidenheimers Po’ Boy Sandwiches as there are for Van Morrison. On Day Three, I meet a group of Loyola students who are there to see Nick Jonas. They’re vaguely aware that the Red Hot Chili Peppers are scheduled to play a different stage at the same time, and they don’t care. I scold them for having terrible taste in music, and they bust my balls for having never heard of The Binder Bakery. In case it wasn’t already clear, the only thing more sacred than the music around here is the food. The Chili Peppers take the stage and launch into Can’t Stop around 5. The acoustics are still not great, but the band is lively and loose. They play most of their hits and wrap up a jammy encore by 7. Which brings me to the curfew. Apparently, the Chili Peppers can stop, and they have a hard out at 7PM, just like everyone else at Jazz Fest. At first glance, the 7PM curfew seems like a huge drawback, a tragic miscalculation somehow still on the books from the gospel tent days. There’s something distinctly less magical about seeing Pearl Jam take the stage at 4:30 in the afternoon, and it’s even weirder seeing them exit while it’s still light out. However, as the week goes on, I begin to see the curfew as a stroke of scheduling genius. Other festivals raise a middle finger to human endurance, programming your favorite little indie bands in the early afternoon, and then trotting out the unmissable headliner nine hours later, by which time you’re strung out and dehydrated and sticky with other peoples’ spilled drinks. Jazz Fest serves up their big guns nice and early, and then ushers the crowd back into the surrounding districts with plenty of gas left in the tank, and tourism dollars to be spread further around. The city itself becomes the logical extension of the festival grounds, and all of the day’s performances are really just pre-game to the epic local nightlife. And yet, by the second and final weekend of Jazz Fest, all manmade curfews become irrelevant. As has been the case since the earliest days of outdoor music, weather is still the One Big Question Mark. Day Six brings torrential downpours, which in turn bring flash floods. Beck, Stevie Wonder, and Snoop Dogg get rained out before they begin. Day Seven sees a drop in attendance, as the weather barely lets up. Persistent rain turns the whole venue into a soggy, stagnant mess. Neil Young powers through a fierce two-hour set, and the remaining diehards tough it out in ponchos and slickers. Throughout the day, I hear allusions to Hurricane Katrina- nothing tasteless or insensitive, more like determinedly upbeat, quiet reminders that this city and its festival have bounced back from far worse. As one filthy, barefoot Neil Young fan points out, rock and roll is not supposed to bright and sunny, anyway. In the end, Jazz Fest concludes not with drums or guitars, but with thunder and lightning. On my way to the exit, I meet a girl who looks like she crawled out of a sewer — soaked to the bone, covered in mud, make-up running down her face. Like me, she broke her phone and lost her friends. She’s already feeling hungover, and has no idea how she’s getting home. She also tells me that she can’t wait for next year.